Even though it’s mid June, the days are cold and wet. I built a small fire just to take the chill off, and thought about the sense of contentment that comes with sitting around a campfire and watching the flames. I’m sure you can remember something similar. The dark night, the cold air at your back, the heat on your face. 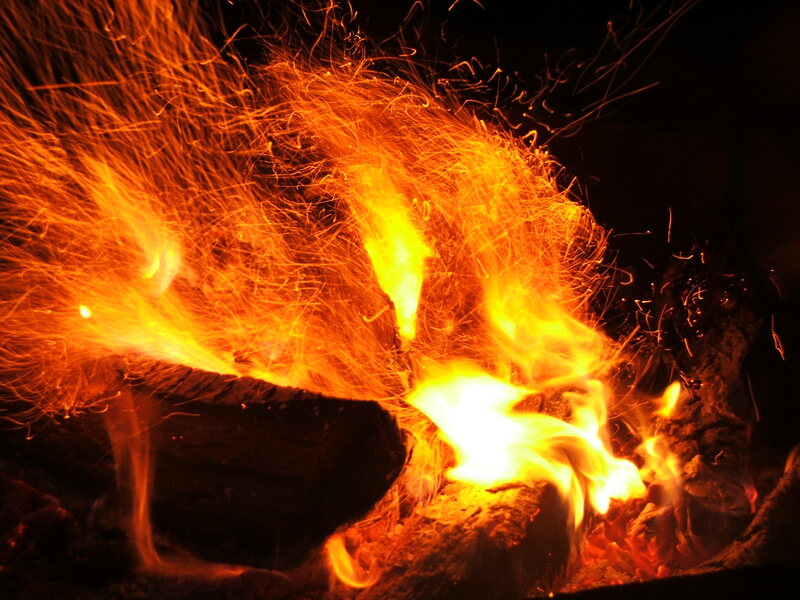 The sparks hitting the tent roof…I wonder if we feel that because of an inherited memory of prehistory when fire meant safety, security, survival. And not only that. While we enjoy quiet times sitting like that, listening to the flames eat firewood, most of the time we tell stories. It’s almost a cliché because it’s so common. Why? What is it about that atmosphere that makes us talk in low voices about childhood memories? Or huddle together glancing over shoulders while we listen to a scary tale? Maybe it’s the intimacy, the cloak of darkness. We all become storytellers sitting near the fire. There’s some odd bond between flames and words. It’s almost spiritual. Next Friday I am going to join a circle of women around a fire next to the river, for a ceremony of transitions for a few girls I care deeply about and have watched grow and become wonderful young women. I know we are going to tell stories about their childhood, about change, about life. And the fire will sanctify those stories like it has done for thousands of years. I still want to know why though. Somehow I understand the feeling of that campfire vibe you speak of, but I seem to be missing that gene. I think I was traumatized early in childhood, and nothing has changed my distaste for watching even controlled flames. Last night I was watching the tv version of Longmire on A & E, and the plot about horses in a burning barn nearly did me in. I forced myself not to change the program the same way I’ve let the words burn and fire into my writing. I’m not comfortable with them, but I’m working on being open. Not sure I could watch horses in a burning barn, either. It’s interesting that you’re taking something that traumatized you and letting it out in your writing. That’s pretty brave. I feel that connection to flame, too, though big fires scare me. With campfires I think it’s partly the creation of that glowing, human-centered space in a vast world of darkness and things outside our control. Fire is a powerful force, but here in a circle of stones we’ve made a little piece of it and caused it to exist for our own benefit. And the way it casts shadows over our faces, the way it heats our bodies unevenly, brings into being a shared moment between those who sit around it. I’m so pleased to have been at your campfire, in thought. 🙂 I do find the layers and depths in fire (and the light it casts) really fascinating. I’ve never tried painting it — maybe I should sometime!